“OK……….there’s gingerbread men, sugar cookies, snickerdoodles and a host of other Christmas cookies, but where the heck are the biscotti?????????????????????? 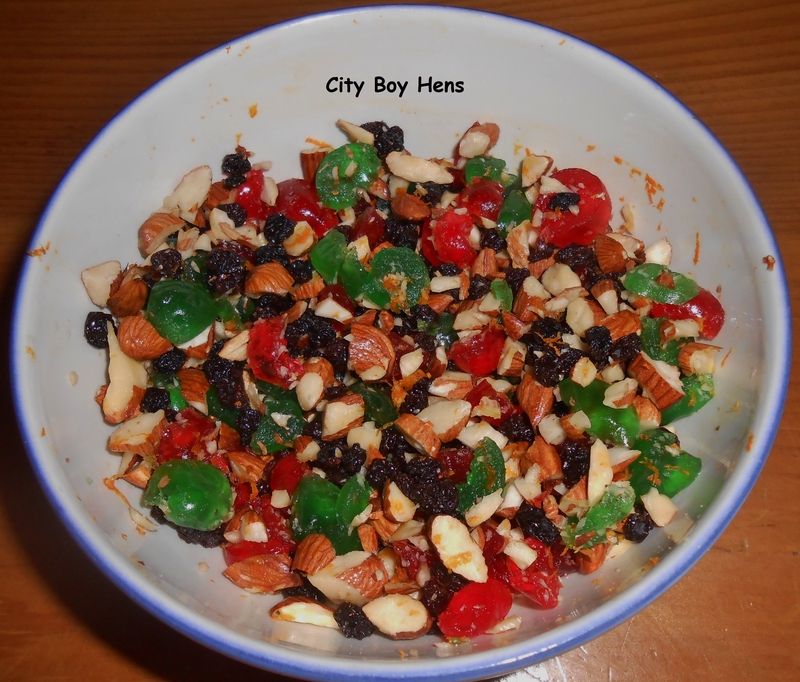 Well……I’m glad to report that Christmas Biscotti has made its introduction at City Boy Hens. 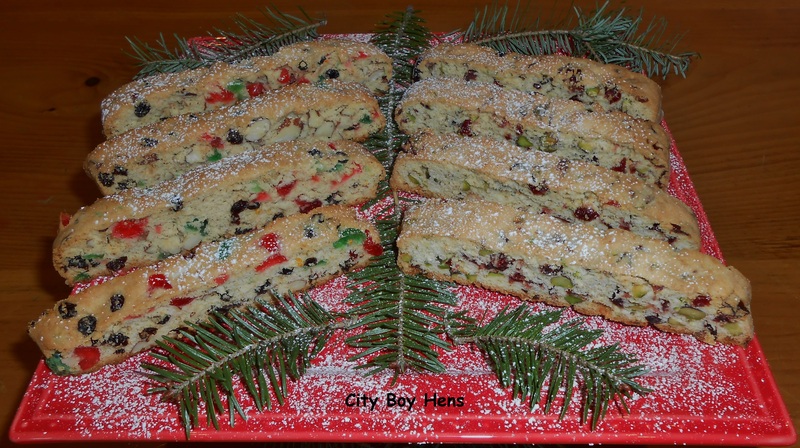 I came up with the recipe by adapting my original biscotti recipe Click Here and some inspiration from my Christmas Fruit Cake recipe Click Here. These cookies are easy to make and look very festive. But, best of all, they are not loaded with sugar and butter which seem to be a common thread in a lot of other Christmas cookies. 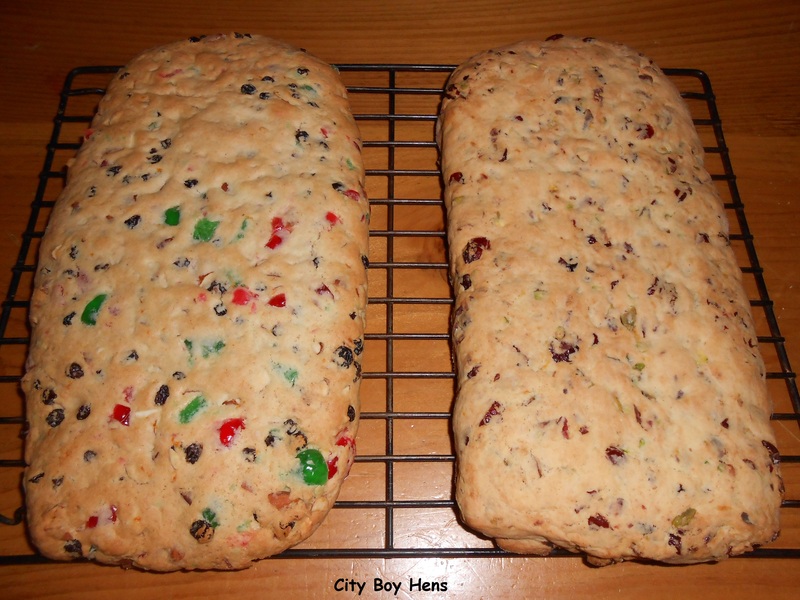 *For the purpose of this post, I have made two separate biscotti recipes. This will allow you to sample 2 different loaves in one try. 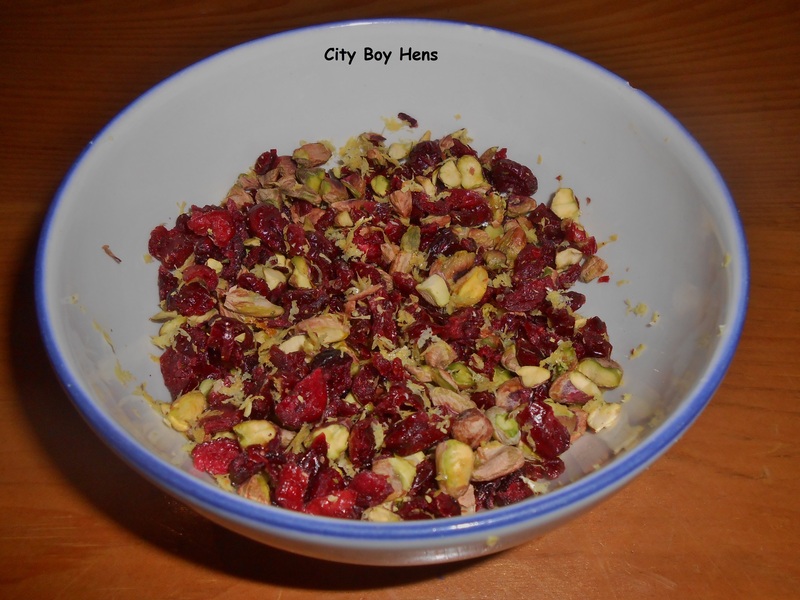 If you are partial to one recipe, than double the ingredients in bowl #1 or #2 (see below). Beat 1/3 cup of room temperature butter for 30 seconds. Combine 2/3 of a cup of sugar, 2 teaspoons of baking powder & 1/2 a teaspoon of salt with the butter. Beat in 2 farm fresh eggs. Stir in 2 cups of all-purpose flour, 1/3 at a time until completely mixed. Form into a ball and divide in half. 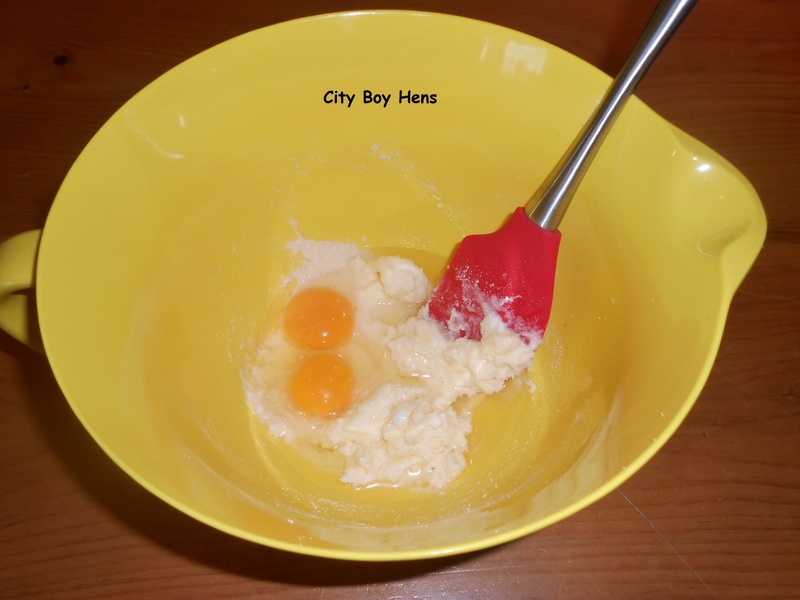 Remove one half of the dough from your mixing bowl and set aside. Add the “Christmas” ingredients from bowl #1 to your dough. Need until all ingredients are completely combined and evenly distributed in the dough. Remove the dough from the bowl and place on a lightly floured surface. 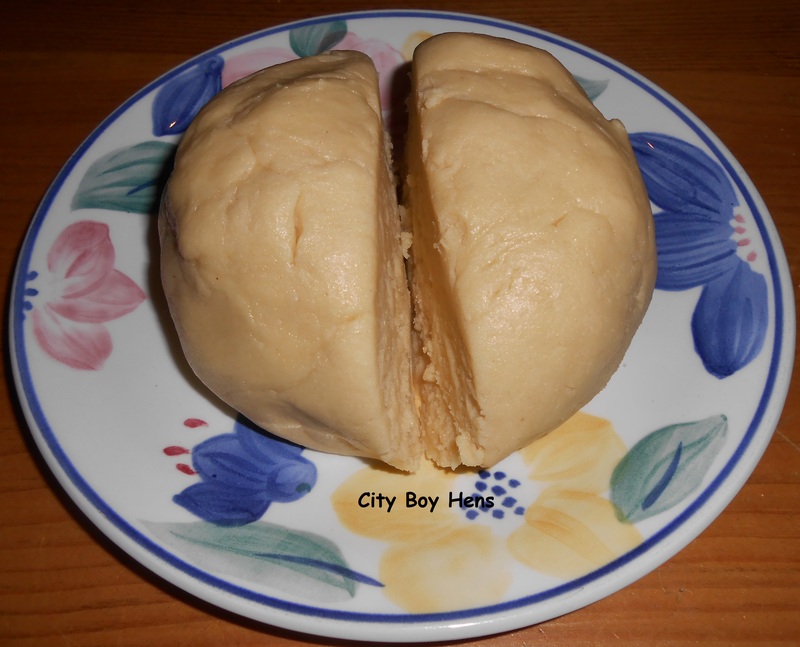 Using the palms of your hands, press and shape the dough until it is around 10 ” long and 5″ wide. 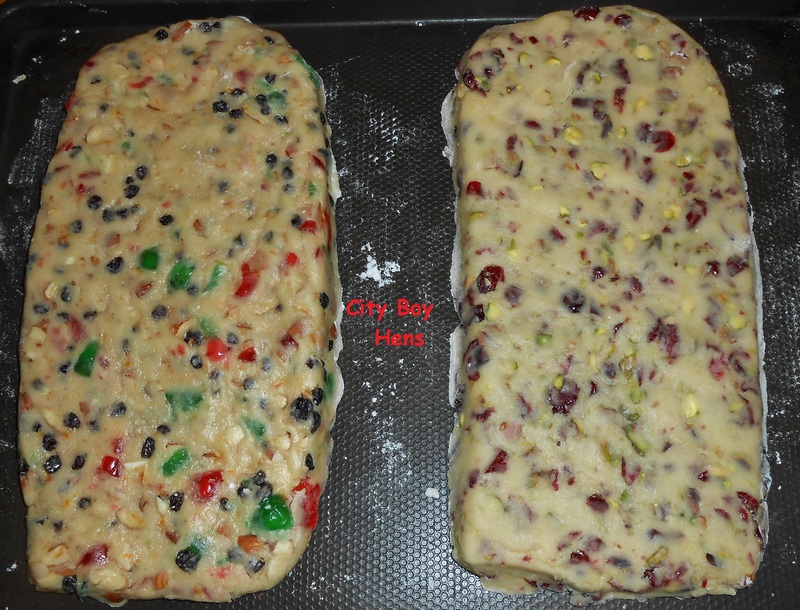 Gently lift up the dough and place it on one side of a cookie sheet. Repeat this process for bowl #2. Bake at 375 Ferinheight for 20-25 minutes or until loaves are golden brown. Remove from oven and cool on rack. Using a serrated knife, cut the biscotti into 3/4″ strips and transfer back on to a cookie sheet and bake at 325 F for another 8 minutes/ side. 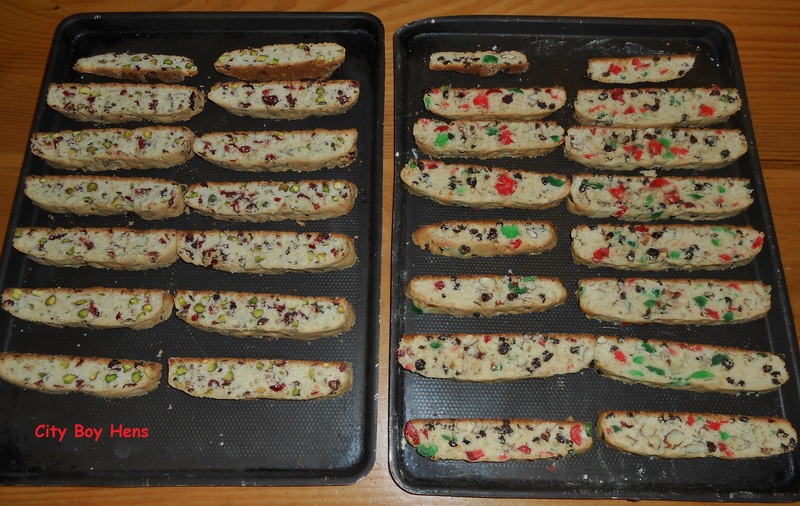 So….there you have it……..Christmas Biscotti. Move over gingerbread men and sugar cookies. There’s a new cookie moving into the festive spotlight. I hope you give it a try! Buon Natale! Yum this biscotti looks delicious! Thanks for sharing at the “From The Farm Blog Hop” this week! Hope you give the biscotti a try. Oh…holy moly. How much do I just LOVE these!??? I will be featuring these on *Mostly* Homemade Mondays tomorrow. I hope that you’ll come back and share some more. Feel free to grab a button, too. Thanks for the “feature”. Hope you’ll give them a try. Merry Christmas. This looks so pretty and I love how you displayed it! Thanks for sharing it with Sugar and Spice Christmas party! Thanks for the “feature” and Happy Christmas to you & yours! It’s my pleasure! Same to you and yours. I love biscotti! And these are so festive. Thank you for linking to the In and Out of the Kitchen Link Party. Hope to see you next time. How gorgeous is your biscotti? Thanks for these recipes, they will be a smash during my holiday parties (yes, parties!) next year – I can’t wait! Hope you enjoy the biscotti!